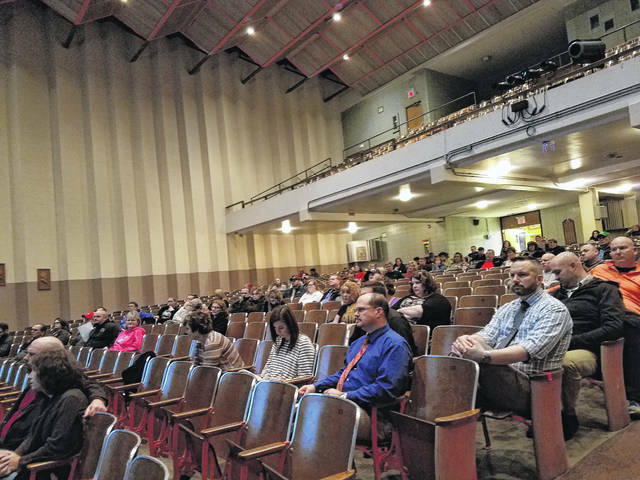 A crowd of parents and Miami Trace staff gathered for the forum Thursday and were updated on the safety improvements made to the district over the last five years. Lewis said these improvements cost between $300,000 and $350,000, and have always been a priority for the district. 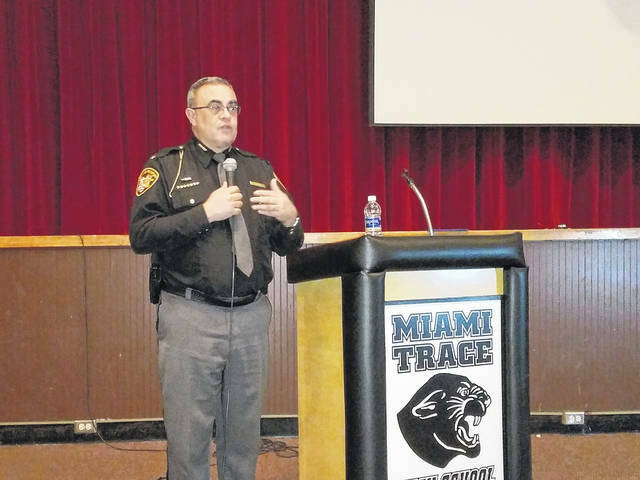 Fayette County Sheriff Vernon Stanforth took time to visit the Miami Trace Local Schools Safety Forum on Thursday evening to address the community on a number of actions the Fayette County Sheriff’s Office has taken to help keep Miami Trace safe. Miami Trace Local Schools held a “School Safety Forum” on Thursday at the high school auditorium to talk to parents and listen to their concerns about how the district keeps the students safe. Superintendent David Lewis began the event with a welcome and introduction of the various members of the school board of education and faculty, as well as other guests to the event. Lewis then began a presentation which showed the district’s safety improvements that have been made during the past five years. Improvements such as a full-time student safety coordinator, a full-time school resource and DARE Officer, 42 employees trained in the ALICE Protocol, the creation of building level safety teams, introduction of classroom door lock upgrades and many more showed off a robust system in place. Jack Anders, student attendance and safety coordinator, spoke to the crowd next to introduce himself and explain his role in the district. In addition to truancy issues, Anders works closely with the Fayette County Sheriff’s Office and school resource officer and DARE instructor, deputy Monty Coe, to identify potential safety issues in the schools. Anders said he speaks regularly with principals and administration about safety concerns they have to figure out if Coe and himself need to get involved. After explaining his job duties, Anders explained some of the safety aspects to the community members in attendance, including additional information with the ALICE training. According to Anders, ALICE is not a linear approach to safety. The program gives faculty and students options on what they should be doing during an emergency. Another addition to the safety system at Miami Trace, which is currently in the works, is a new “STOPit App.” Anders explained that this app gives students or staff the capability of anonymously and instantaneously reporting issues they find. Whether a student takes notice of an act or is a victim of harassment or bullying, or a teacher needs to alert administration of a threat, this app will give them an immediate line of contact with someone who can help. Following Anders was deputy Coe, who briefly explained his position in the school before Fayette County Sheriff Vernon Stanforth spoke to the crowd. On March 14, Lewis announced during the event, Miami Trace High School students will be leading a vigil and program in memory of the students who were shot and killed at Stoneman Douglas High School in Parkland, Florida. Lewis wanted to address concerns about the program and emphasized with the crowd that it was not going to be an anti-gun rally. He explained that the students wanted to honor the lives that were lost and stand up against school violence. Participation for the event will be voluntary and high school principal Rob Enochs and Lewis will be working with student leaders on the details. Finally, the community had a chance to ask questions of the Miami Trace Local Schools administration and Fayette County Sheriff’s Office staff about concerns they may have with the safety of the schools. Many asked for clarification on topics or discussed safety devices used in the schools. One question Lewis anticipated was also addressed: Where does the administration stand on arming teachers? For more information, contact the Miami Trace Local Schools at (740) 335-3010.
https://www.recordherald.com/wp-content/uploads/sites/27/2018/03/web1_20180301_190748.jpgA crowd of parents and Miami Trace staff gathered for the forum Thursday and were updated on the safety improvements made to the district over the last five years. Lewis said these improvements cost between $300,000 and $350,000, and have always been a priority for the district. https://www.recordherald.com/wp-content/uploads/sites/27/2018/03/web1_20180301_193028.jpgFayette County Sheriff Vernon Stanforth took time to visit the Miami Trace Local Schools Safety Forum on Thursday evening to address the community on a number of actions the Fayette County Sheriff’s Office has taken to help keep Miami Trace safe.